It's been a while since I've done Dine LA Restaurant Week, but I recently checked out a new (to me) restaurant, Commerson on La Brea. I've read that this place is one of the underrated gems in LA, so I was excited to try it. 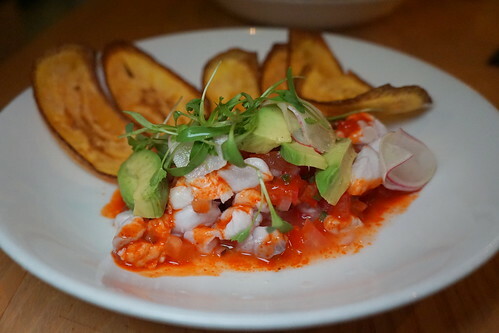 Red snapper ceviche with avocado and plantain chips. The portions were quite good for the price and as you can see, the ingredients they use were obviously fresh. 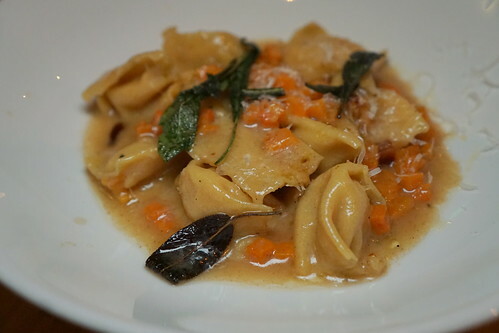 One of the other choices was the butternut squash agnolotti with parmigiano reggiano and brown butter sage. This agnolotti is always a good pasta dish to have in the colder months, and Commerson's rendition was a good one. I look forward to eating out on the holidays of other countries because it is an opportunity to experience something new. For that reason, I enjoy eating out on the French National holiday of Bastille Day. 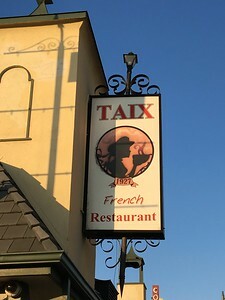 I was happy to learn that Taix was featuring bouillabaisse as their special that day. Given a choice or proteins, I veer towards seafood and within that food group, I prefer shellfish. 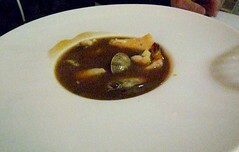 Therefore, bouillabaisse satisfies that craving. Visiting Taix is like taking a trip backwards in time. Driving into their lot, you are warmly greeted by a valet. Entering the restaurant, you walk down a dimly lit hallway. To your right is the bar and straight ahead is the maitre d' station. Inside the dining room are large comfy booths and frosted glass for privacy. On Bastille Day, the male employees wore red felt berets. My server, however, was female and she wore a ribbon with the French national colors around her neck. The Tour de France was taking place in France and Taix featured specials each race day. Even the highlighted wines were from areas near each stop on the tour. 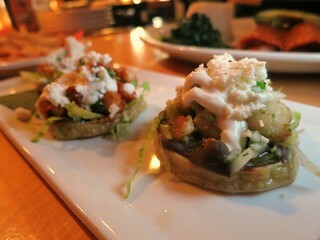 Also taking place through Friday is Dine LA and Taix is one of the participating restaurants. 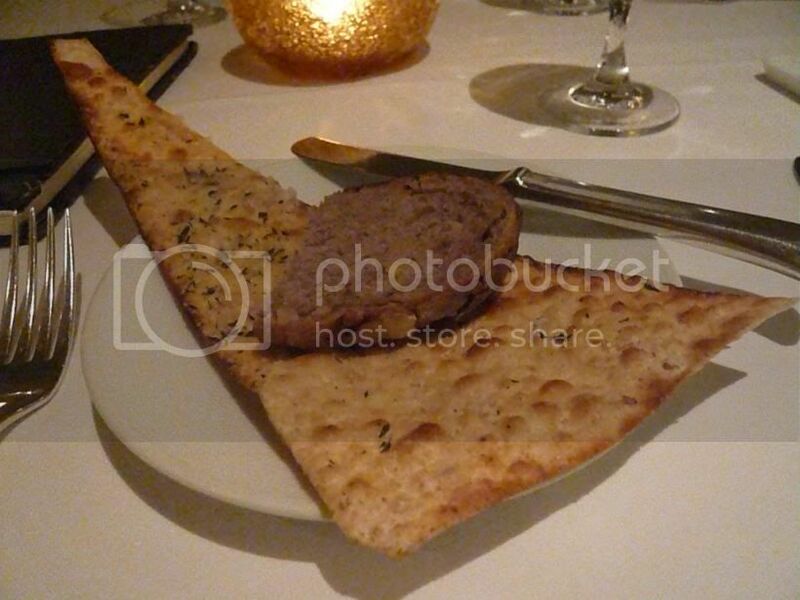 When you sit down in one of their plush booths, you receive fresh sourdough bread and crudité. 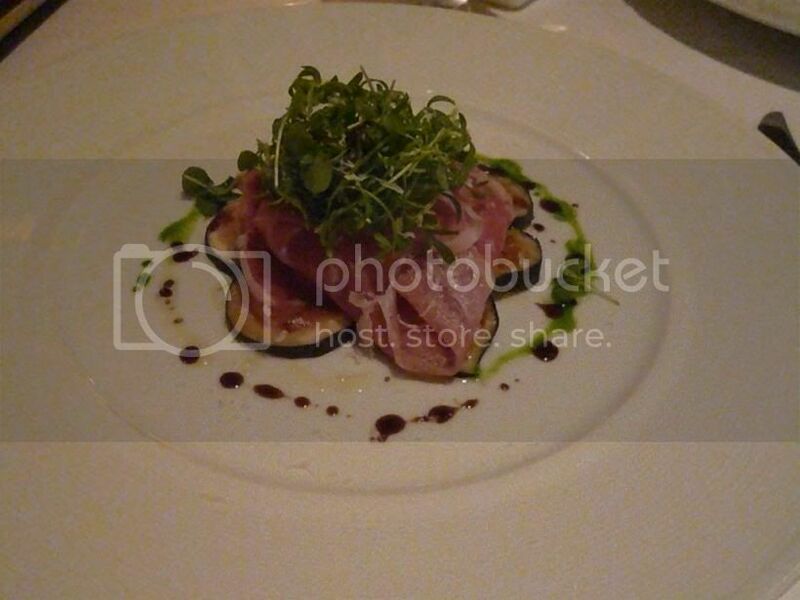 I ordered Claudia’s beet salad from the Dine LA menu and the special that day, bouillabaisse. 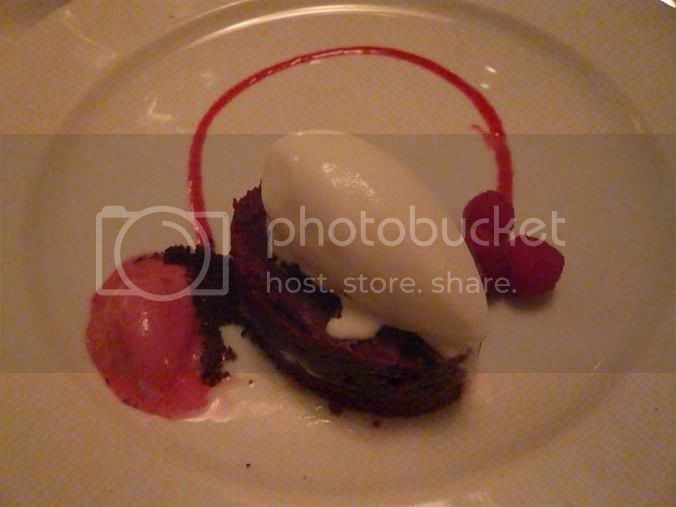 The beet salad was nicely plated. 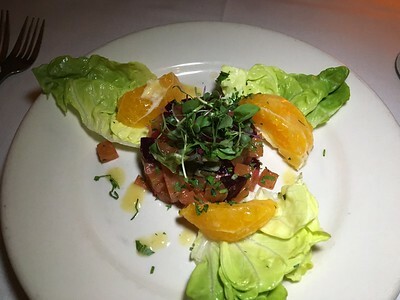 I like that the ingredients were chilled, the butter lettuce was crisp, the oranges were juicy, and the garlic vinaigrette complemented the beet salad. I used to go to Napa Valley Grille a lot when I worked in Westwood, but since then I haven't gone as much. The lunch was a pleasant reminder of Napa Valley Grille's good food and generous portions! Very fresh and light! I don't like salads with too much dressing, but this one had a nice light dressing and a lot of the flavors came from the almonds and raisins. This lighter option still had plenty of tuna to fill you up for the rest of the day. 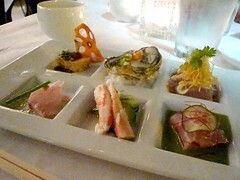 Dine LA dinner at K-Zo in Culver City is $44 for 3 courses and the choices seemed pretty good. When I saw the regular menu though, I noticed they have 5 courses for $58 any day, so whether or not the $44 is a special deal or not gets a double take. The appetizer options are 1) Rokuten Mori (a selection of 6 appetizers), 2) Seafood salad, or 3) Bouillabaise. The Rokuten Mori gives you a sampling of a variety of cold seafood appetizers including crab sunomono, oysters, yellow tail sashimi, ankimo, etc. All of them were well prepared with fresh ingredients. 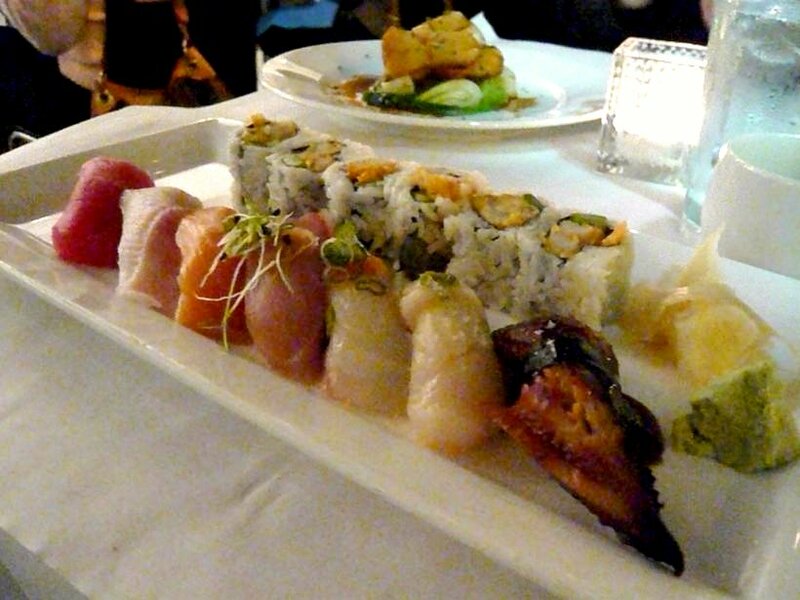 The bouillabaise was pretty good, but it doesn't compare to the one I had at Bond St.
For the entrees we had a choice between: 1) a plate of nigiri sushi + popcorn shrimp and asparagus roll, 2) grilled rib-eye steak, or 3) braised Chilean sea bass. Having a plate of sushi means you're not getting each piece fresh from the hands of the itamae, but nonetheless they were still good with fresh pieces of fish - although they are mostly your standard orders. 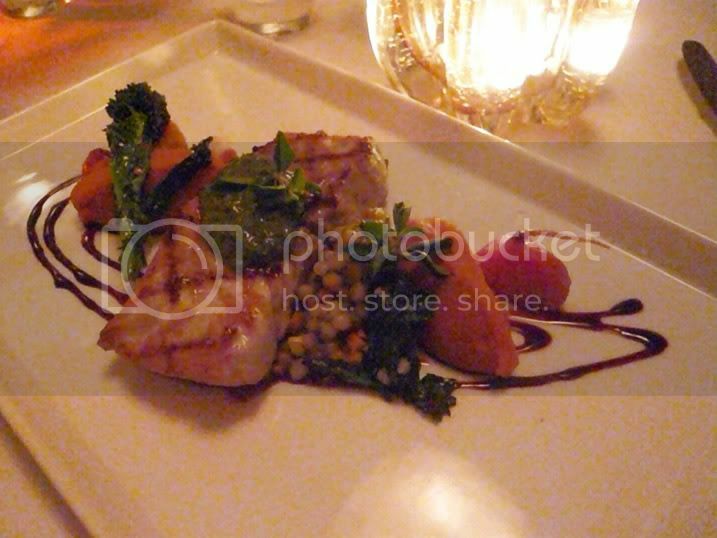 The Chilean sea bass was well prepared and tender. The mashed "purple potato" and steamed bok choy were good accompaniments and filled you up. 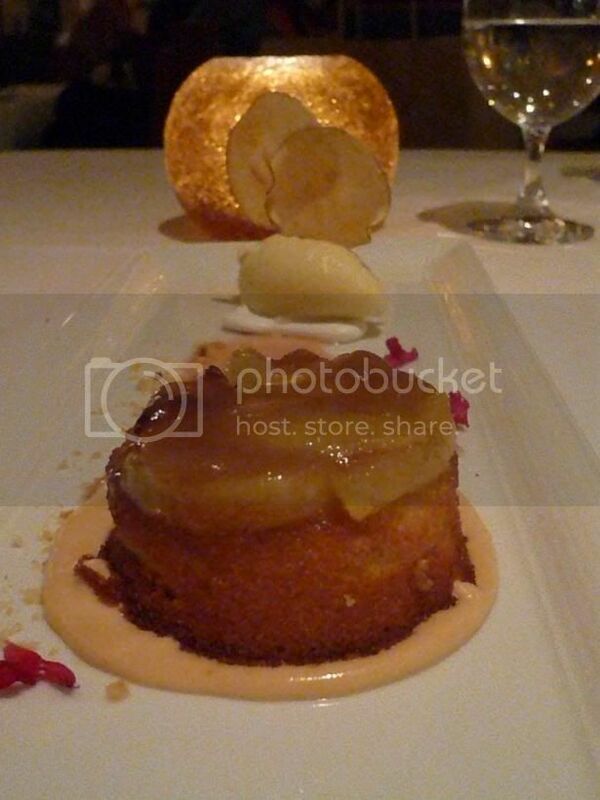 For dessert, we ordered the apple "tatan" (hey, that's how they spelled it :P). 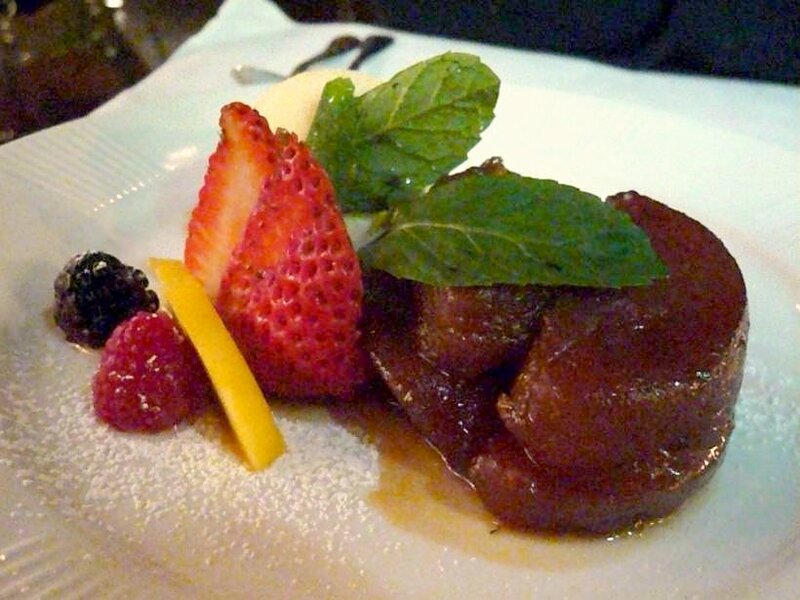 The apple tatin was pretty nicely caramelized - although the strawberry accompaniment seemed an afterthought and deterred from the sweetness of the apples. I ordered the purple sweet potato parfait because it seemed most interesting. This was a very enjoyable dessert - like a sweet potato zanzai - with red bean, mochi balls, and vanilla ice cream. The "sauce" was made with Okinawa purple sweet potato. I would definitely get this one again, especially since this was one of the more unique desserts they offer. Overall the K-Zo dineLA meal was good and satisfying (although the portions are smaller than many other restaurants), but as I mentioned, since they normally have a 5 course meal for $58, I probably wouldn't hurry here if you only have limited opportunities to do dineLA. DineLA 2010 Restaurant Week Launch! What's on Your Agenda? 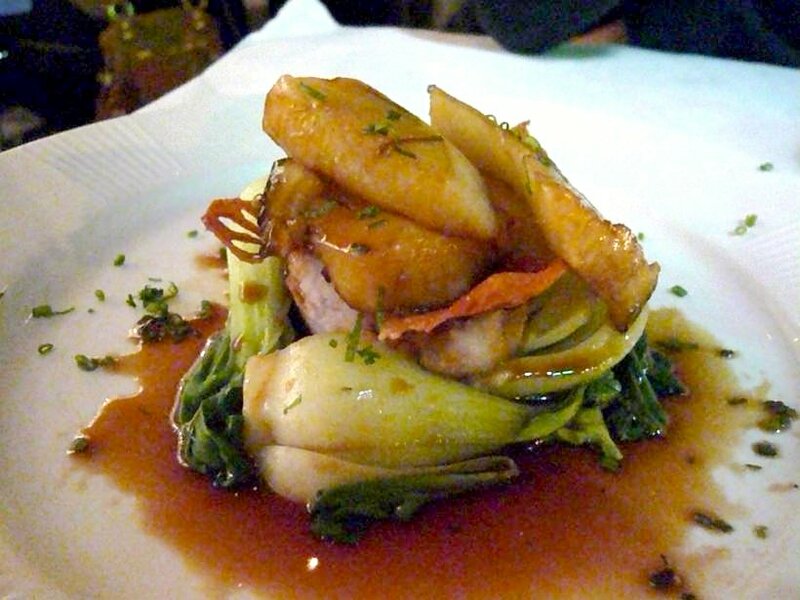 The 2010 Dine LA Restaurant Week is here! Has everyone started dining out? Last week Dine LA held a launch party at the Hollywood Roosevelt and dozens of Los Angeles chefs, restaurateurs, and media people gathered over cocktails served up by the Library Bar. Starting from the refreshing arugula gimlet to the interesting umami-driven-but-I-probably-can't-drink-a-whole-glass-of Shiitake Manhattan (shiitake infused bourbon, yes) to the sweet strawberry cocktail as a finisher, Library Bar was hard at work to keep us happy. 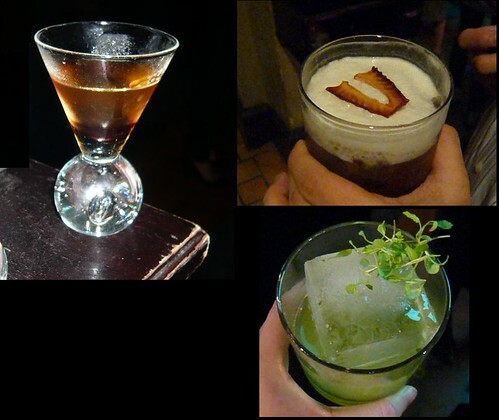 My favorite was definitely the arugula gimlet. I haven't been to Library Bar before but am definitely planning a visit after this party! We mingled over Mexican food provided by the Roosevelt hotel, me trying to find all the LA chefs around and listening to Villairaigosa gave a short speech. Chefs in attendance were almost everyone in town from Joachim Splichal, Ludo Lefebvre, John Sedlar, Ben Bailly, Mark Gold, Josie Le Balch, Akira Hirose, Keizo Ishiba, and many many more. 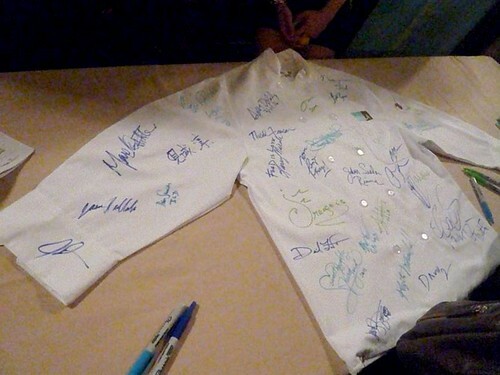 I wonder what they'll do with this coat ... it might fetch a fun price for an auction! 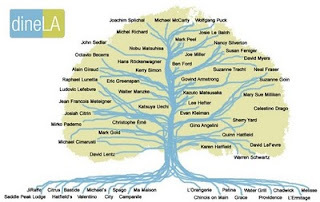 During the launch party they also released their Los Angeles chefs/restaurants family tree, the first ever! It looks something like this, but is actually more interactive than that, so you should just go on their website and check it out. It's quite interesting to see which restaurants have been responsible for launching these great chefs! Spago, Campanile, and Patina are definitely some of the more productive ones. 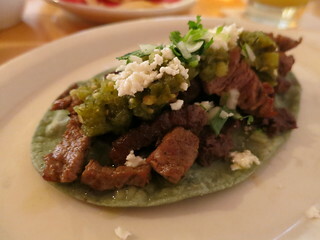 Dine LA has also been running a DineLA-a-Day! 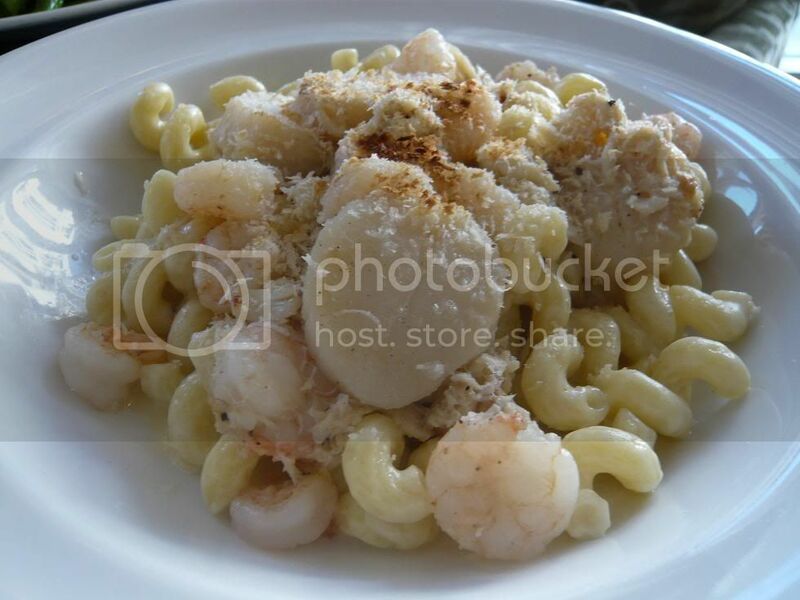 daily giveaway of $100 certificates to various restaurants! You can check out this page for the day's giveaway, and be sure to look at the hints (you may need to refer to the family tree). 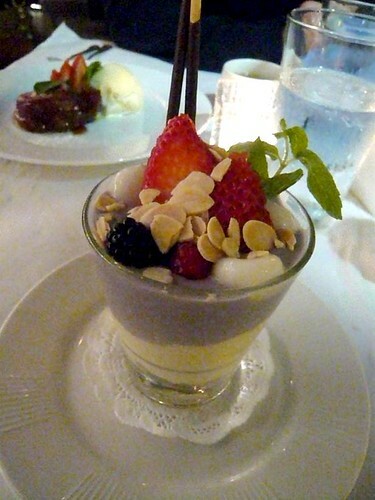 If you still can't decide from the menu, feel free to check out my old dineLA reviews. 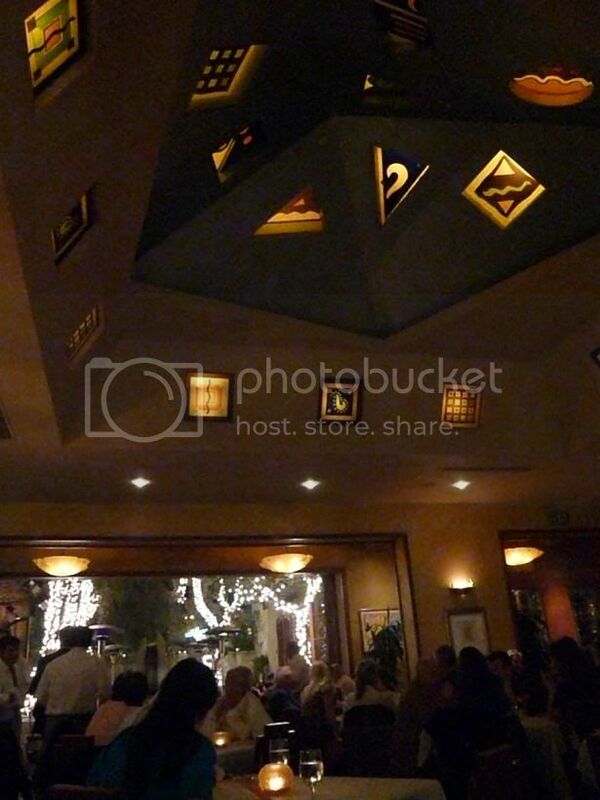 DineLA 2009: Spago. One of DineLA's Best Deals. Just last week LAist released tips on how to get the most out of dineLA and one of their points is to not go for restaurant week menu offering dishes not originally on their regular menu. At Spago, none of the dishes (minus desserts) offered are on the regular menu - you can get on-the-menu New York Steak for a hefty supplement of $35 though. Does this mean Spago dineLA is not a deal? Spago, one of the longest-standing LA's star eateries, the flagship of the Wolfgang Puck empire. Overhyped, you say? Let's not forget the Michelin stars this place got (before Michelin decided to abandon our city) and the fact that Nancy Silverton of La Brea Bakery and Mozza and Mozza hailed as a pastry chef from this place. Fact is, Spago got famous for a reason, and it managed to maintain that reason. Not to mention they have one of the best patios in town. Now, the deal. Let me see here. Burrata fig salad with jamon serrano and either poussin or kurobuta pork chop+dessert seems worthy of a $45 Spago meal to me. If you actually look at their regular menu, you'd notice that their cheapest entree offered is $38. 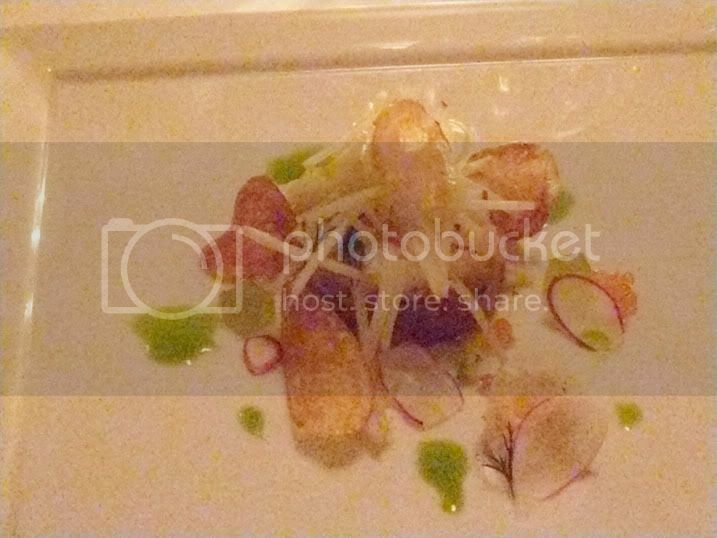 A $45 3-course Spago meal? That would be impossible without restaurant week! Yeah, but they might give you crappy dishes, smaller portions, etc, so let's see what you actually ate. Fig salad with burrata and jamon serrano. Great figs, great burrata, great jamon. I am not sure about the combination of it all though. I certainly loved the burrata with the jamon and the greens, but not with the figs. I ended up eating the figs separately. Smaller portion? I think not. This pork chop was so big I managed to take leftovers home. It was a very good pork chop, quite tender and moist, well seasoned. Great flavor and very complementary sauce and garnish. Getting the supplements make dineLA much less of a deal. 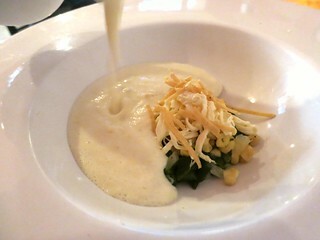 A sweet corn agnolotti which runs for $19 on the regular menu is available for a $14 supplement. An order of New York Steak is $61 on the menu and available for a $35 supplement for DineLA. 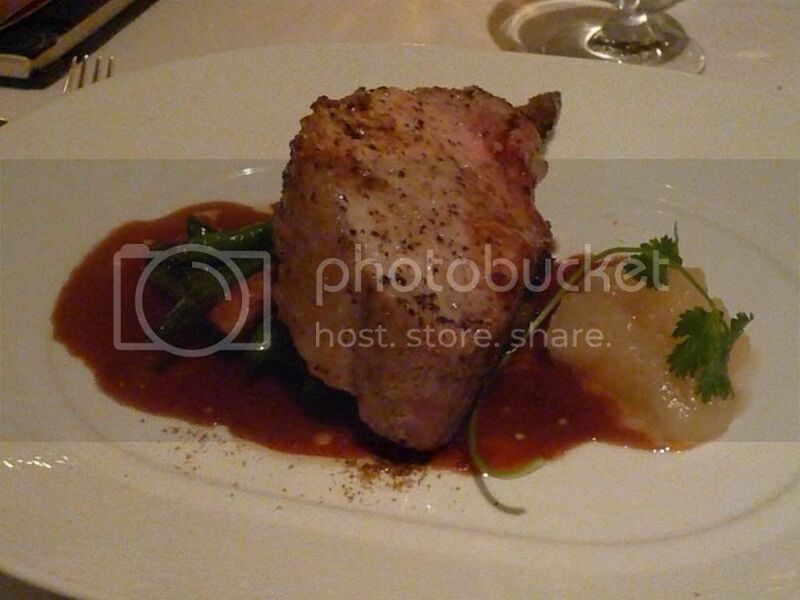 A great steak, no doubt, but I was happy with my Kurobuta pork chop for much less money. 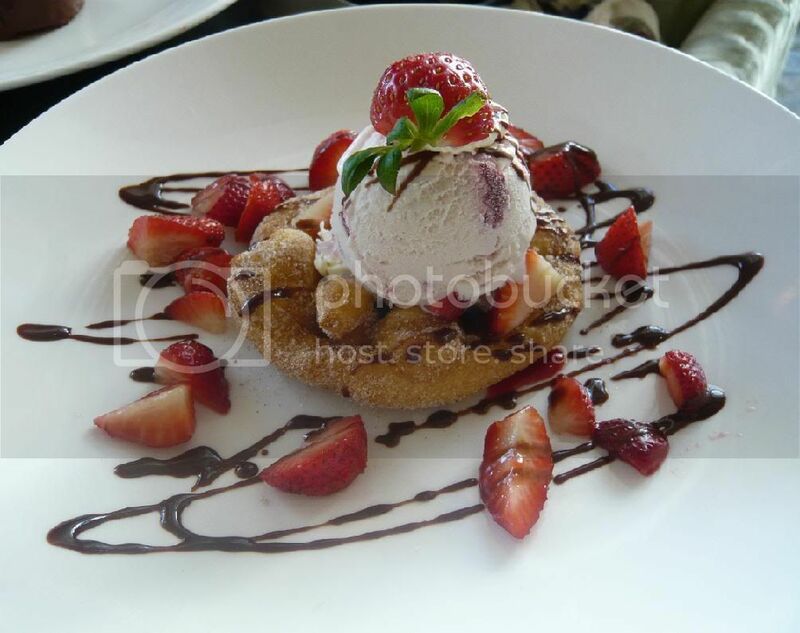 The desserts offered actually do come from the regular menu. I got the Apple Cider Upside Down Cake. The cake had a great flavor but it was a bit too dry for my taste. I should've remembered these types of cakes are generally too dry for my palate. A lot of people seemed to like this though. 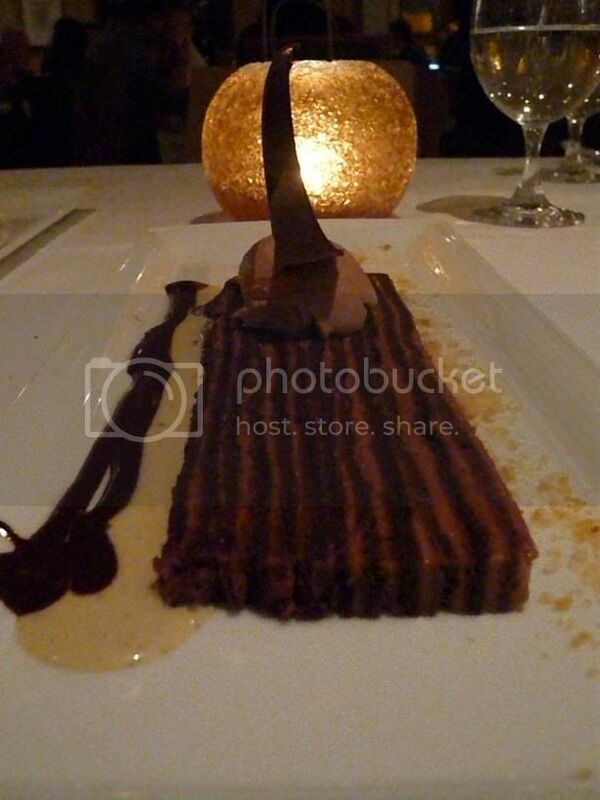 PepsiMonster got the Dobos, 12 layer chocolate and praline cake with nutella gelato. I like his dessert much better, the chocolate buttercream layer was very smooth but you get just a teeny crunchiness. Great taste and texture. We had a great meal overall. $45 for this 3-course meal (plus leftover for lunch, mind you)? I'll take it any day. Water Grill was supposed to be my dineLA finale - before they decided to extend it LA&OC Foodie had planned this dinner and extended invitations to me and Rumdood, which we jumped on (or at least I did). Since Water Grill is participating in the extension - all throughout February, I decided to blog about it sooner rather than later. Although our party was late for our reservation, Water Grill graciously held our table for us. As the night went on, all tables were filled - good sign. The $44 prix-fixe dinner menu is, naturally, all seafood (except for dessert). I started with the House Cured Salmon, with Potato and Brown Mustard Seed Salad with Dill. The cured salmon was great, but I thought that the dish as a whole was a bit too busy. I would have preferred it simple and highlight the delicious taste of the cured salmon itself. I suppose I could've just picked off everything else. I really enjoyed the fish. It was quite meaty with a nice grilled flavor, but still moist. I liked it with the pearled barley but although I did enjoy the yam, I thought the two of them were better off being eaten separately. For dessert, I had the Red Velvet Pudding with Mascarpone Ice Cream. It's like an extra moist red velvet cupcake with ice cream rather than icing. It was quite rich. Tasted pretty good but got too rich for me at the end, especially when the ice cream was all gone. Throughout the dinner, our server was very nice, friendly, and even funny. The food was very solid and with the great company, we all really enjoyed ourselves. 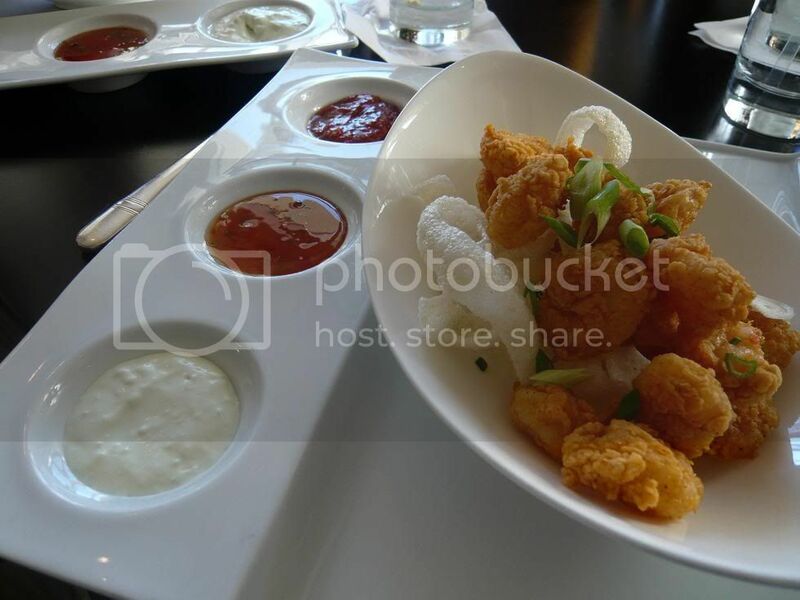 Considering the regular price for a fish dinner entree is about $36, the DineLA menu is quite a deal. If you guys considered checking this place out for the extended DineLA, I'd recommend it! DineLA 09: Filet Mignon at Wolfgang's Steakhouse, So-so. 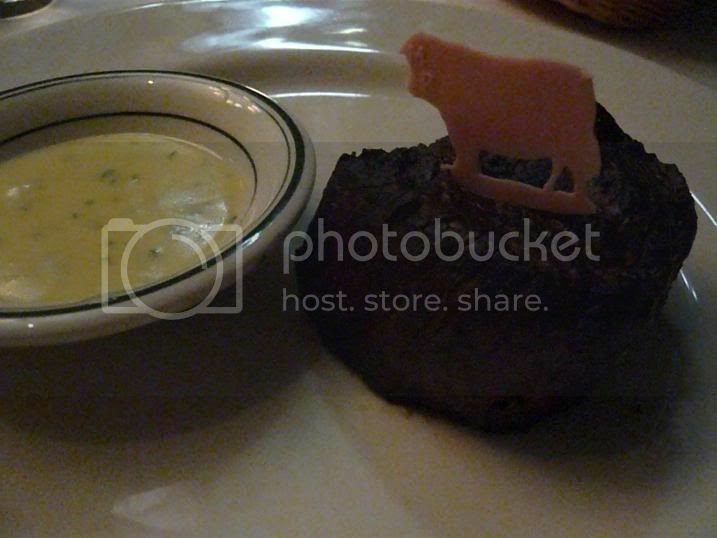 $34 for a 3-course meal that includes filet mignon. Sounds pretty good, right? 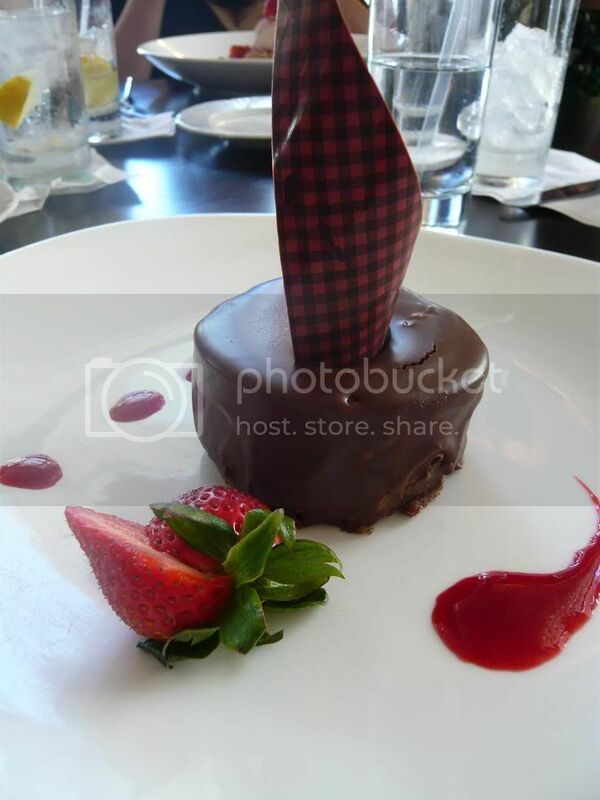 That's what I thought and so I went to try Wolfgang's Steakhouse for the DineLA week - it was the cheapest of the steakhouses (no, Ruth's Chris is not even in the running) and seems to have pretty good reviews. I dragged Rumdood and Pepsimonster here with me. I started with the lobster bisque. 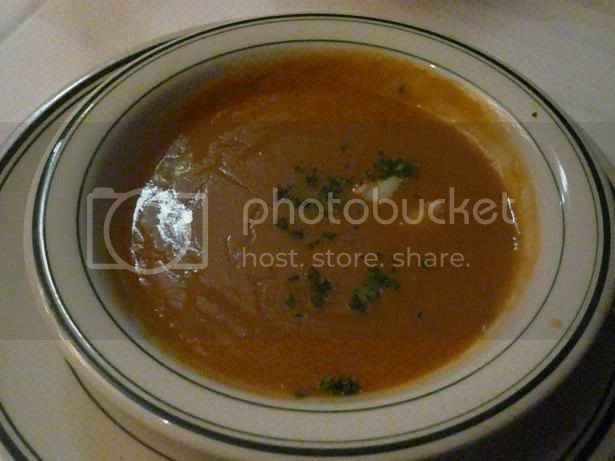 The bisque was a tad too salty - maybe they had been heating the whole pot up all day/night long? I did find two bite-size pieces of lobster in it (ooh yay). As always, I ask for my steak medium-rare. Here, the middle part was indeed medium-rare, but the outer sides were rather overcooked so I didn't start enjoying it until I get to the middle part. This steak was not as flavorful as we've had elsewhere. Good, not great. The portion for the sides are generous. 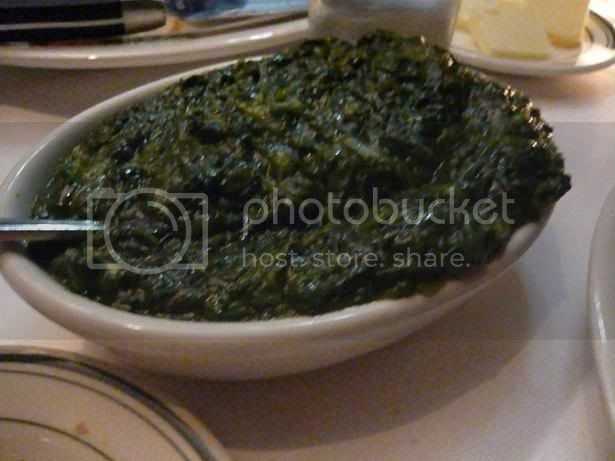 Among the three of us we got all of the available offerings: creamed spinach, german potatoes, and mashed potatoes. Oh, and not only were the portions generous, they messed up and brought us extra servings of creamed spinach and mashed potatoes. But no, we didn't eat them (we didn't even finish the first serving). Spinach anyone? 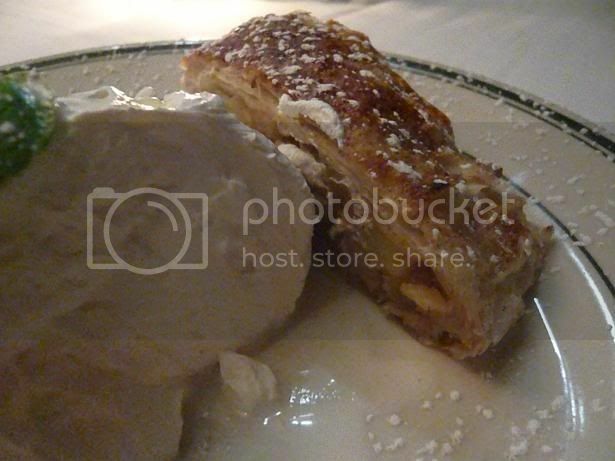 I thought this was okay - the pastry was rather soggy and it was served room temperature. They should've kept it crispier and warmer and this would've been much better. Overall we were underwhelmed. The food was good enough as to not ruin the great company and we finished dinner just fine - but it definitely could've been better. 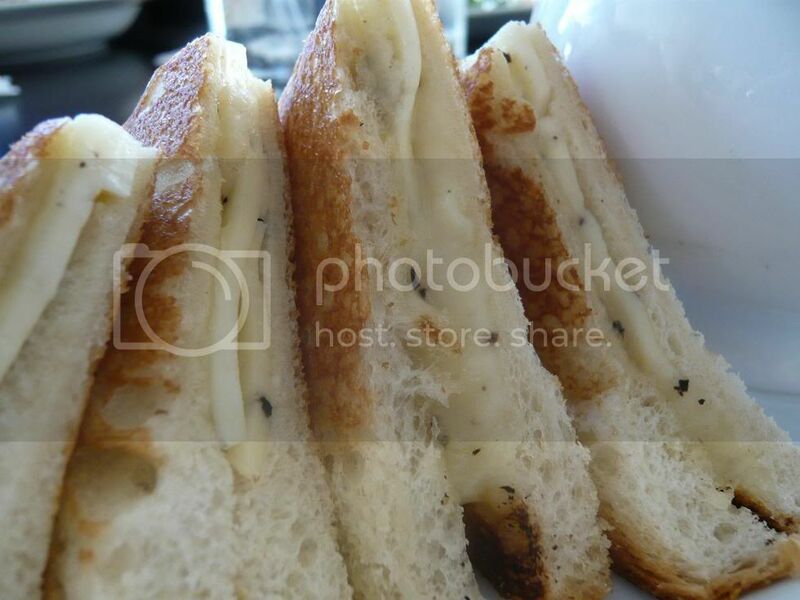 The truffled cheese sandwich on the menu lured us to lunch at Ocean and Vine. 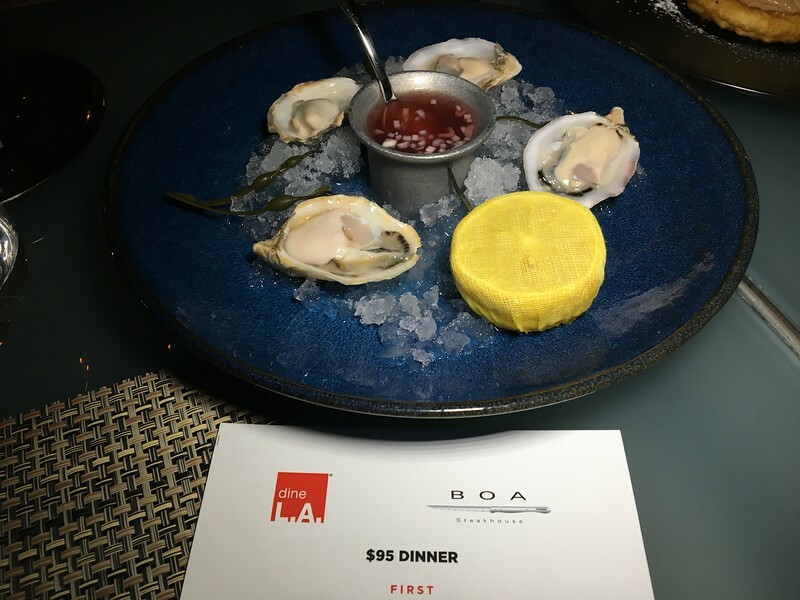 As it turns out, Ocean and Vine isn't open for lunch on weekends but we were able to get the dineLA menu at the lounge inside the same hotel (Loews), Papillon. Papillon boasts a nice ocean view, especially if you're strong enough to brave the cold and sit outside (we weren't!). It came with three separate dipping sauces(cocktail, "sweet chili" - think fish sauce with chili, and wasabi aioli), which makes it more fun! 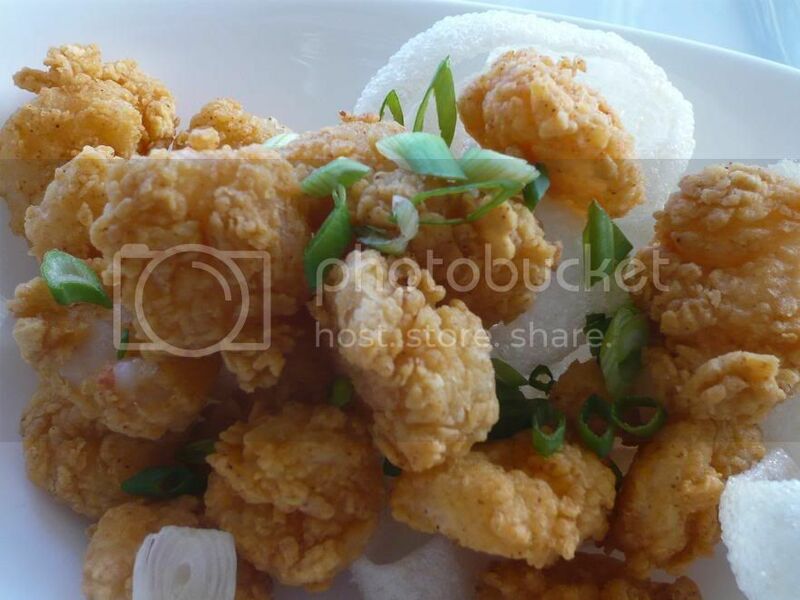 The shrimps were not that big, but were nicely crisp and light. It wasn't too greasy or too bready. Portions were also quite generous. 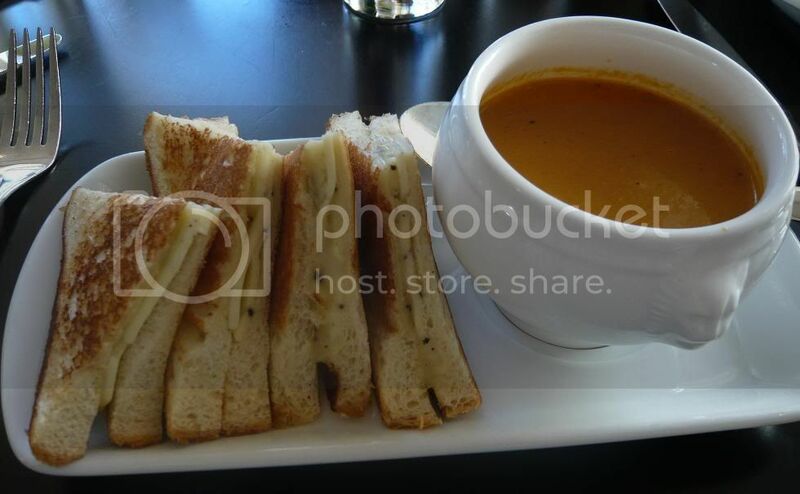 The tomato soup was surprisingly very good! The cheese has not really melted and so the sandwich tasted rather dry. It was better when I dip it into the soup - but then that loses some of the truffle essence. My friend's sandwich seems to have been better prepared and she really enjoyed it. This wasn't cheesy enough for my taste - or for what I imagine to be "mac n cheese". 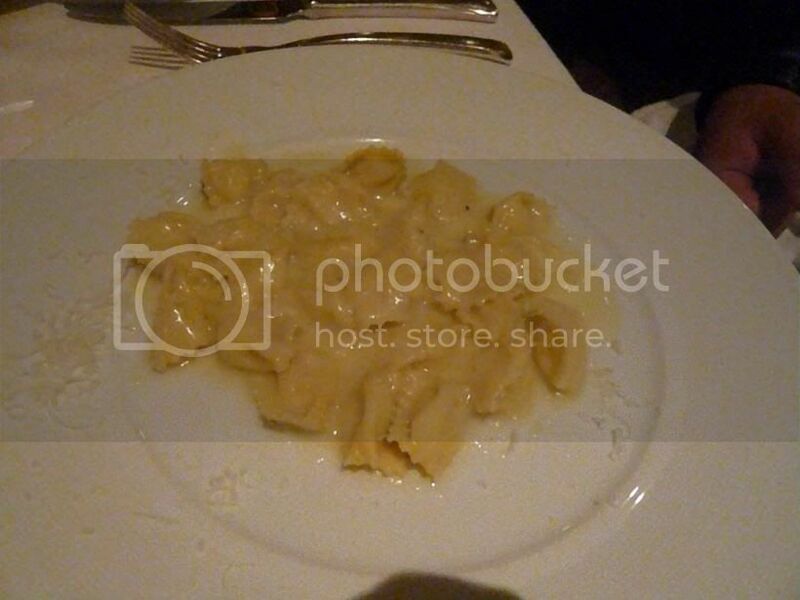 It was a decent 'seafood pasta' although nothing outstanding. The third option was a salmon dish, which this other girl ordered. Apparently it was overcooked though. Good chocolate cake, rich and dense. Nothing outstanding, but definitely very enjoyable. This funnel cake tasted more like a crispy doughnut, but nonetheless we did enjoy it. It was somewhat dense, but eating it with the ice cream helps a lot. Lunch cost us $22 per person. 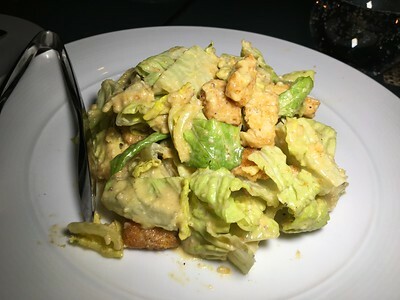 The food was nothing outstanding, but good and solid, and the portions were generous - so if you're looking for a dineLA lunch place, this may be an option to consider.